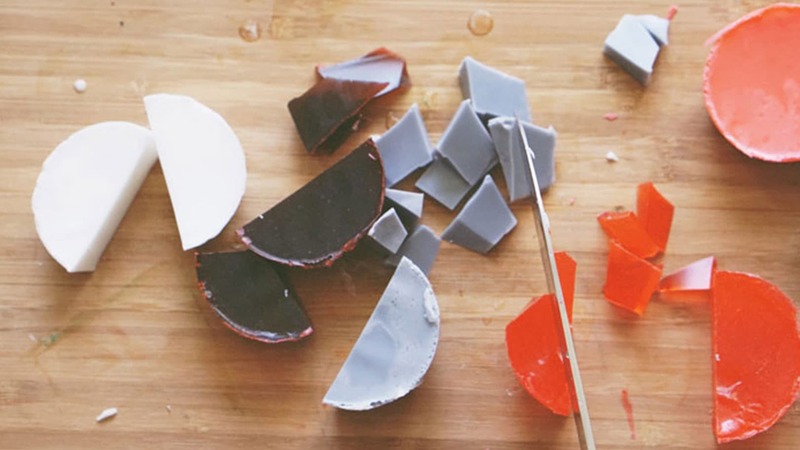 For our latest collection, Lava Rock, we were inspired to give our soap making skills a try with this rad DIY. This was by far the most time consuming DIY we have done, but the end results were worth the wait! 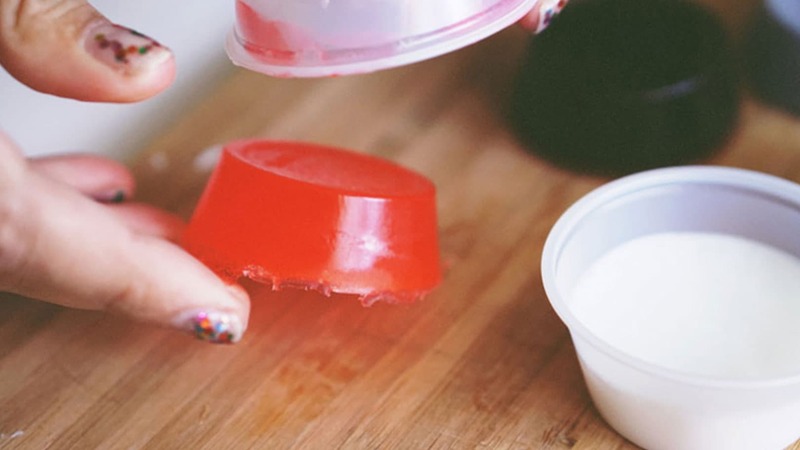 Start by cutting your soap into little cubes and placing them in your measuring cup. If you get the large soap molds like I did, you’re going to cut it in fours and grab one block and cut that into cubes. 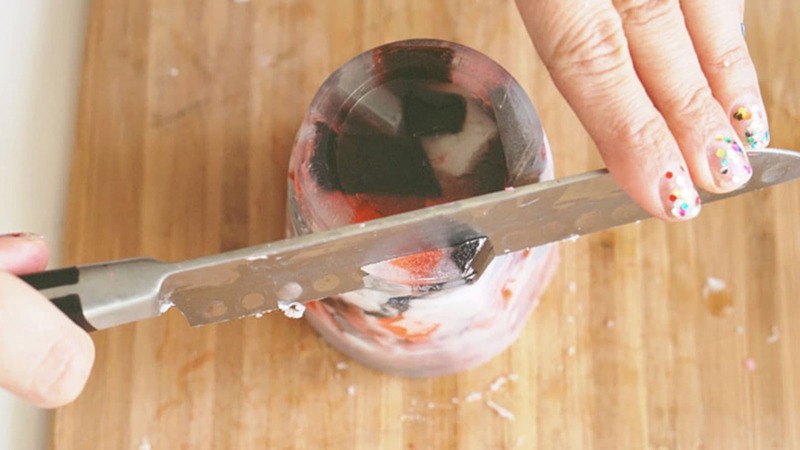 You’re going to melt some clear soap and some white soap in separate batches. Microwave the cup for about 15 seconds until completely melted. If you still have some lumps, microwave it just a bit longer. 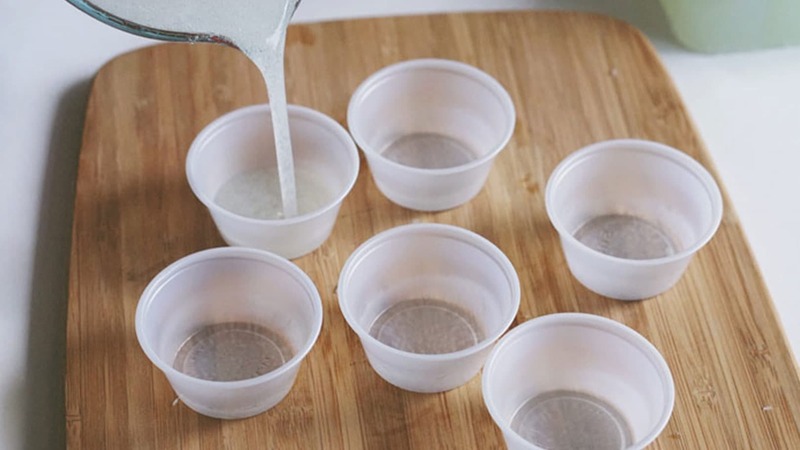 Pour your melted soap into the 2 oz cups. 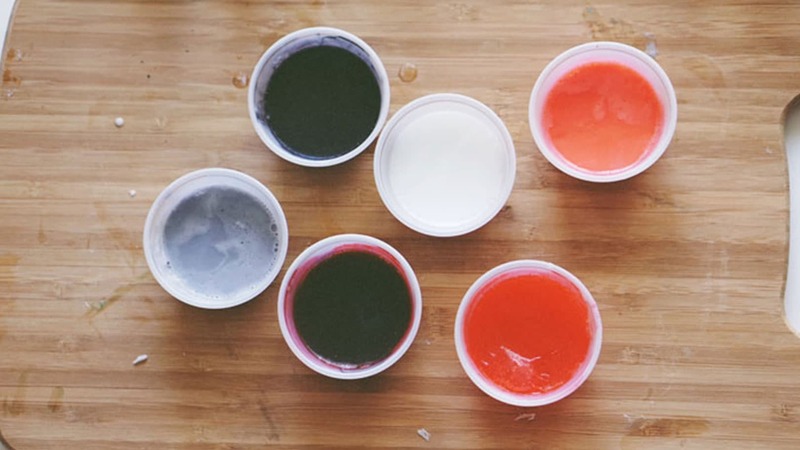 Next add your food coloring. Choose whichever colors you want for this particular soap mold. We chose blacks and blues with reds and oranges for our Lava Rock inspiration. 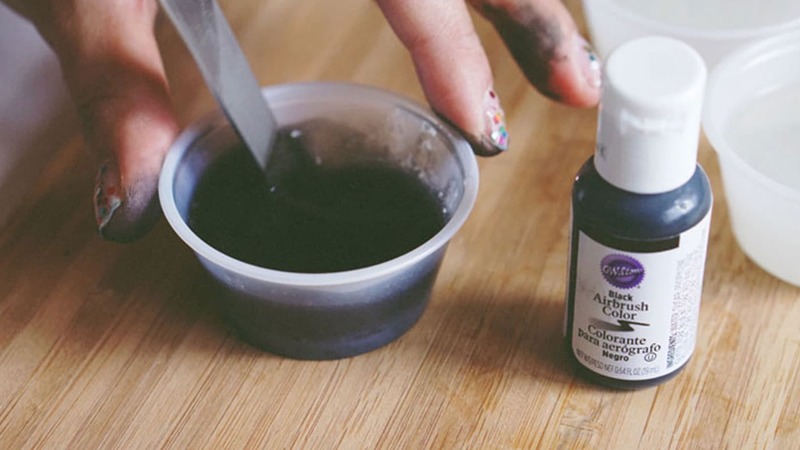 1 drop makes a light color while 2-4 make darker colors. You get to choose how light or dark you want your colors. Stir the color in well. This step gets a little messy so make sure to have some paper towels on hand. Once you’re done with all of your colors, you can sit and wait for them to cool or you can be impatient like me and stick them in the frreezer to speed up the process. 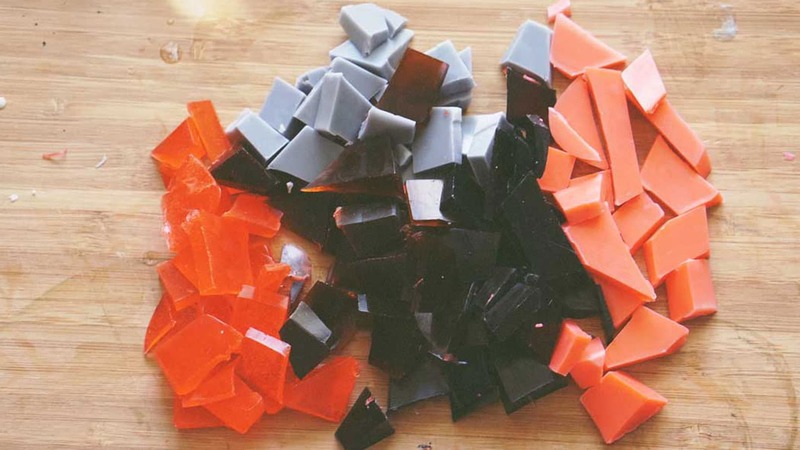 Start slicing your molds into thin shards and different shapes to give them a natural look. 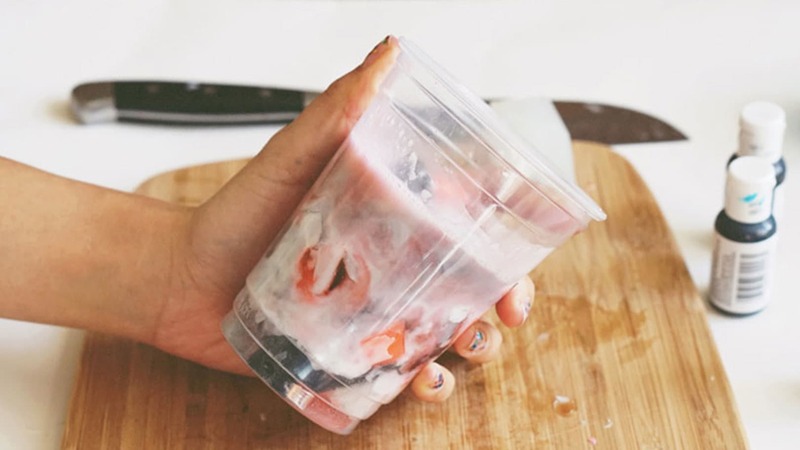 Put your shards into the plastic cup. 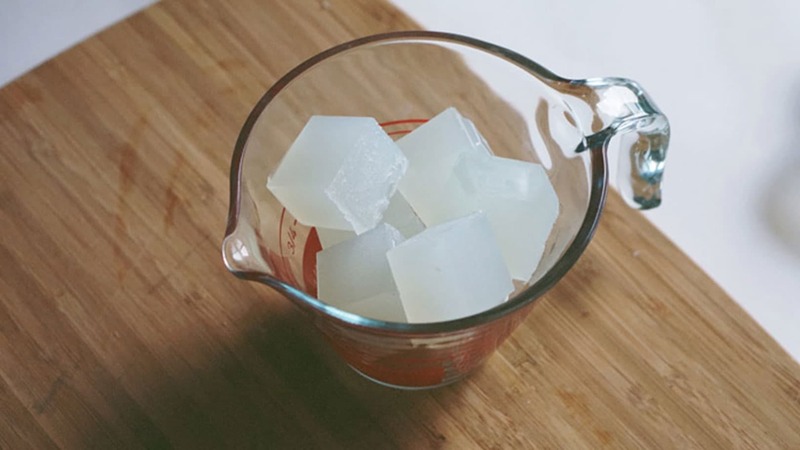 Grab some of the clear soap that hasn’t been used yet, cut it into cubes, place the cubes in your measuring cup and microwave them for 15-20 seconds until completely melted. 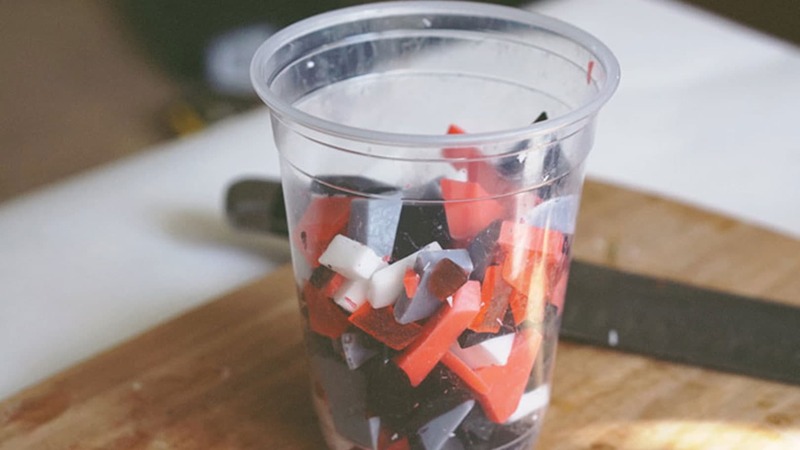 Pour the melted soap into the plastic cup with all of your shards. 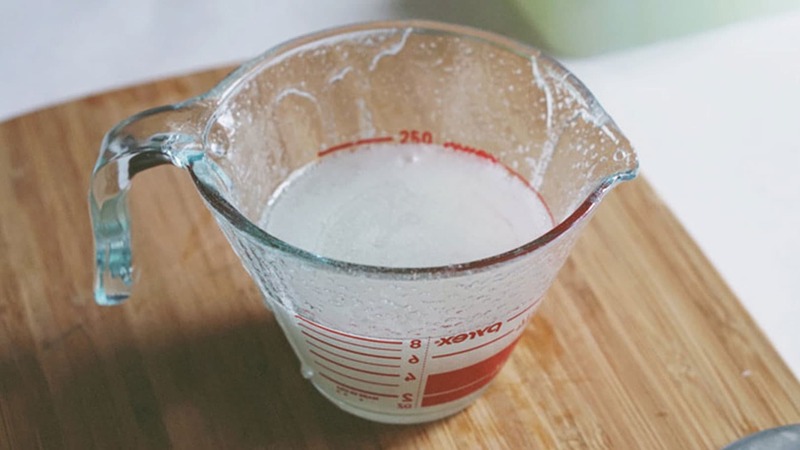 Repeat this step with the white glycerin soap. Pour over the shards again. 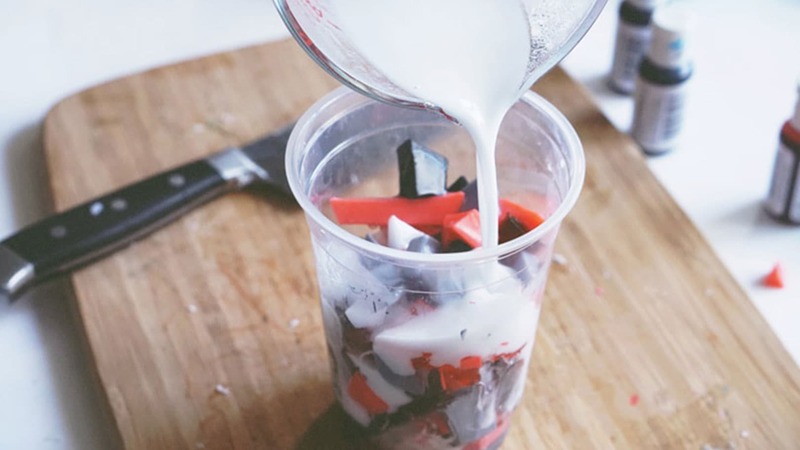 The point of this is to mend these pieces together and slightly melt them to give a milky effect. If they don’t seem to be melting, pop the cup in the microwave for about 10 seconds. 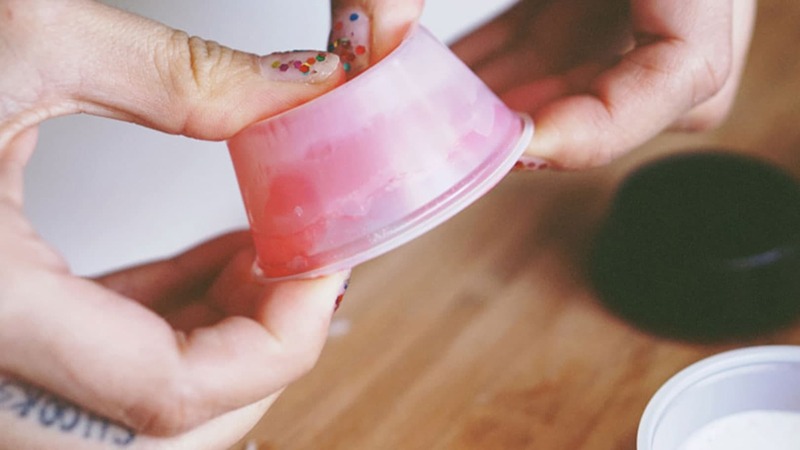 Once your soap has cooled, make a small incision towards the top of the cup and peel it away. Here is where you get creative. We went for a gemstone / mineral look. Cut down the sides at an angle. Once you’ve cut around the whole mold, get started on the top. Once you get to the top, cut at a deeper angle to make a point. 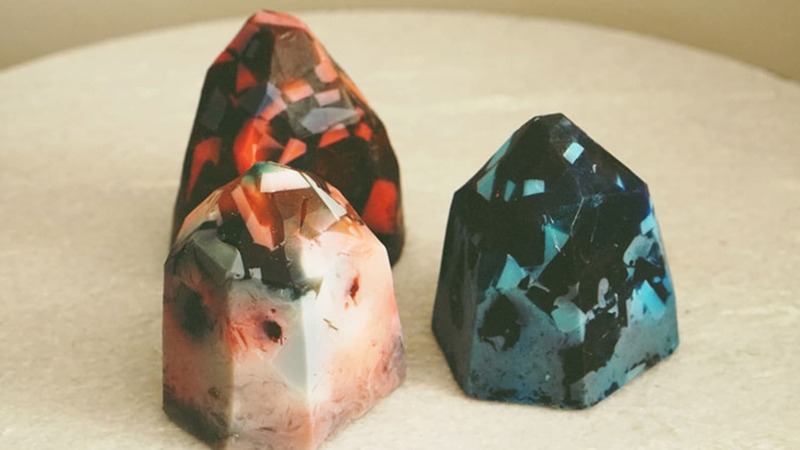 This will give you the look of a gemstone or mineral rock. There you go! 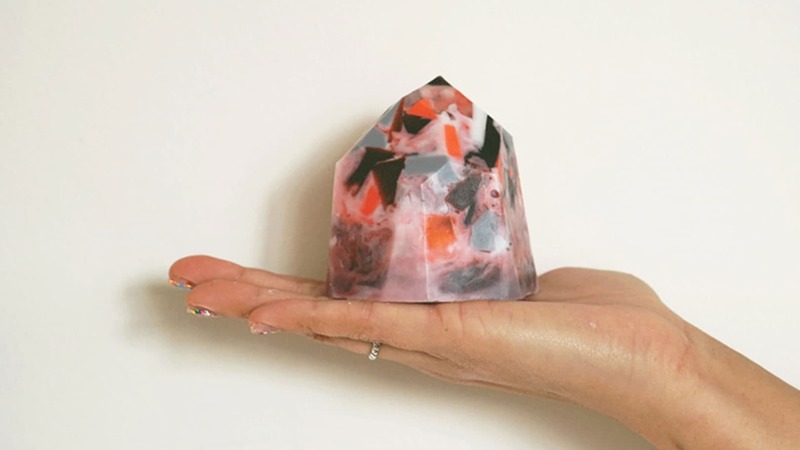 One lava rock soap mold! These gorgeous soap molds make the best gifts and look so cute in your home!